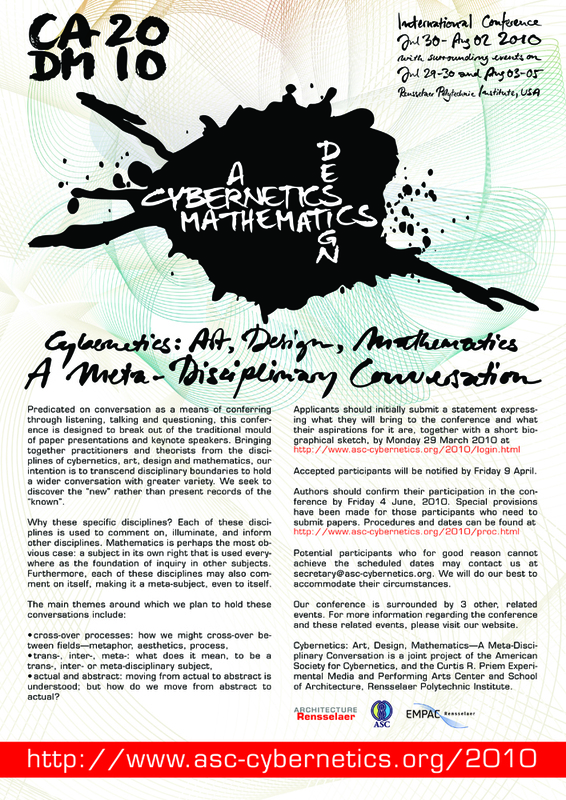 Cybernetics: Art, Design, Mathematics — A Meta-Disciplinary Conversation is intended to provide a forum for discussing and conferring, and to raise the new questions rather than report on answers to the old. Those invited to participate on the basis of their submitted statements of interest (via this profile setup link and this login link) may chose to submit a paper responding to one or more of the conference themes. Submission of a paper is not a requirement (nor is it deemed desirable) for attendance. However, we recognize some who will attend would like, or will need to publish a paper. We have, accordingly, made arrangements for these participants. Papers submitted for the conference will be accepted on the basis of peer reviewed paper abstracts. There will be a special mechanism for presenting papers at the conference, and for improving accepted papers through a second peer reviewing process. Draft papers will be published 1 month before the conference, on the conference web site. We will give a fuller specification of this process at this time. Final, refereed papers will be published as part of the series “Complexity | Design | Society”. See Proceedings for more details. Details of appropriate and acceptable formats will be issued when all paper abstracts have been refereed (April 19th 2010). We will consider non-traditional presentations, and how to use non-print media, individually, as they occur. The processes of refereeing, presentation and paper revision will be elaborated in the spring. Please keep an eye on this page.